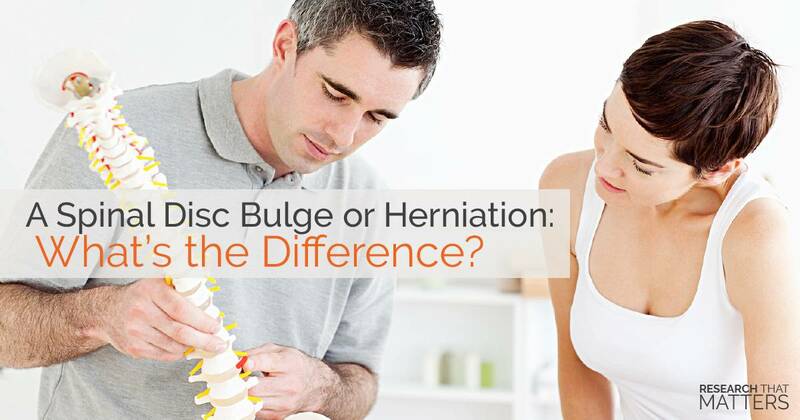 Disc Bulge or Herniation: What’s the Difference? 25 Mar Disc Bulge or Herniation: What’s the Difference? The bones, discs, ligaments, and muscles of your spine are designed to help you maintain proper spinal alignment, posture, and movement. There is a small rubbery disc between each set of bones or vertebrae. These discs act as small shock absorbers for the vertebrae and nerves that come out of each spinal segment. They have a tough, rubber-like outer layer called the annulus fibrosus and a soft jelly-like center that is called the nucleus pulposus. As you age, the curves of your spine can fall out of alignment or there can be direct injuries to the discs through trauma like lifting heavy objects or in car accidents. As a result, this can place uneven stress on your spinal column and discs, increasing the chance of having a disc break down and either bulge or herniate. A disc herniation occurs when the inside of a spinal disc breaks through its outside wall. Bulges can occur when pressure increases within the disc but the contents remain in their respective areas.